Let's work together to make Kerish Doctor 2019 even better! 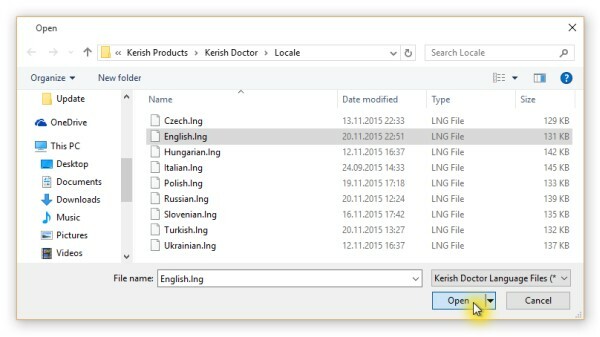 Is your native language missing from Kerish Doctor 2019? Did you find typos in the application? 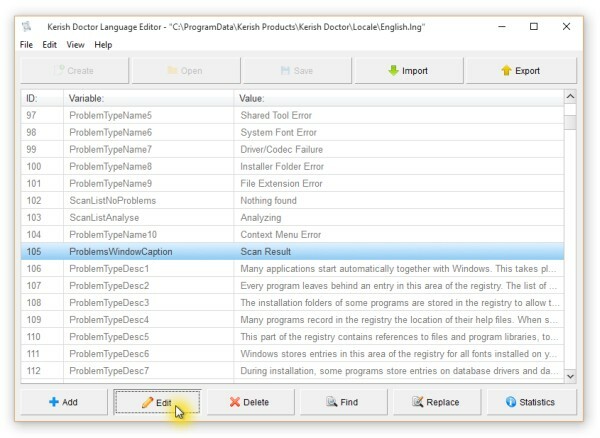 The Kerish Doctor Language Editor allows any user to create new language versions for the application and edit existing translations. We welcome your help with translating the application into new languages and correcting typos in the existing languages. As our way of saying thanks, we are glad to provide users with license keys for the software, including free updates and technical support. Send your created or revised language files to admin@kerish.org (or links to them), and we will update our official language components. 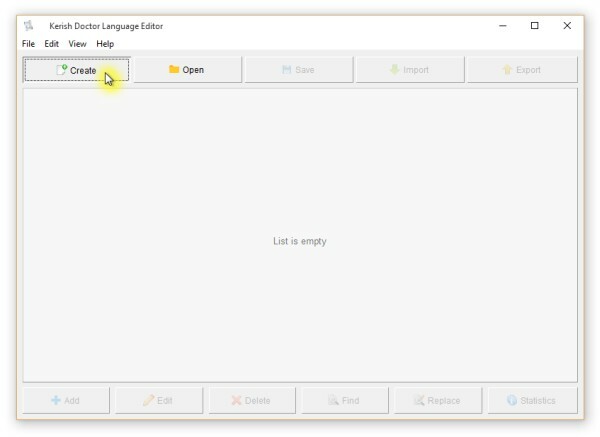 If you have any questions about how to use the Kerish Doctor Language Editor, our technical support team would be glad to assist by answering them. For Windows XP: "C:\Documents and Settings\All Users\Application Data\Kerish Products\Kerish Doctor\Locale"
For Windows Vista/7/8(8.1)/10: "C:\ProgramData\Kerish Products\Kerish Doctor\Locale"
How do I translate files into a new language? 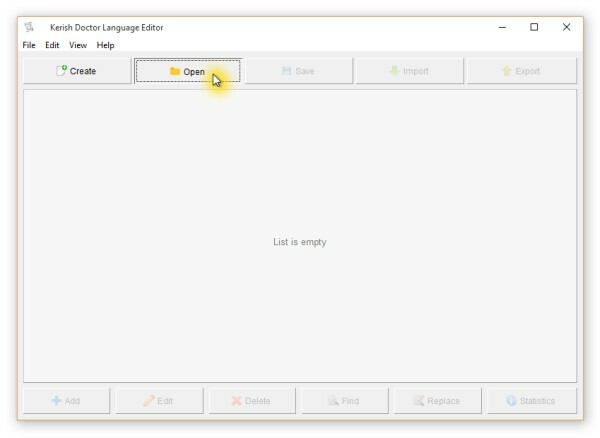 In order to translate Kerish Doctor 2019 into a new language, open the language editor. 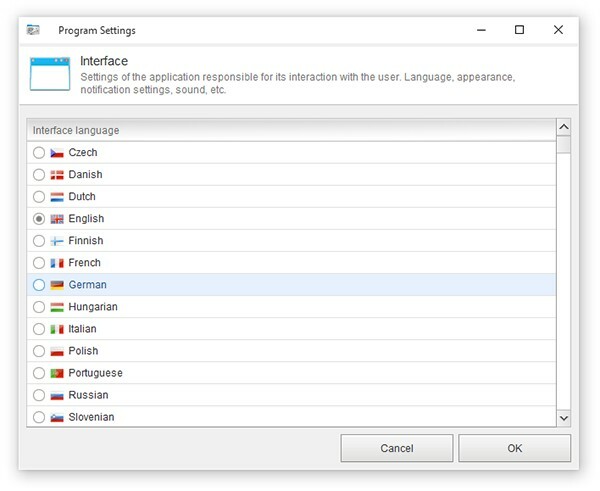 In this example, we will look at translating the application interface from English into German. A dialog box for creating a new language opens. Now let’s take a look at what we need to fill in. A new target language version can be created based on the existing source language file that is being translated. In this case, we will select an English language file, since in this example we will translate the application from English into German. An "open file" window appears. In this case, select the English language file "English.lng". After selecting the file, click "Open". 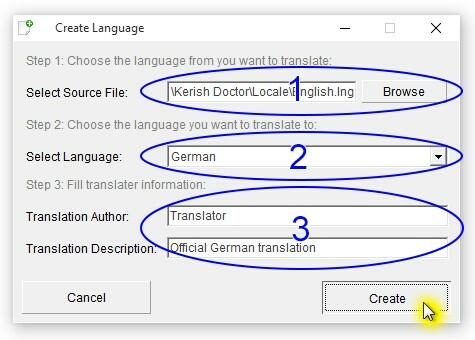 In the second field (2), choose the target language into which you will translate Kerish Doctor 2019 from English. In this case, the target language is German. All the names in the language list are in English. The third set of fields (3) contains information about the translator and a short comment about the translation. These fields are usually prefilled with default information, which in our case is "Translator" and "Official German language". After filling in all of the fields, click "Create". As you can see from the message that is displayed, a template is created on the basis of the translation source language (or English in our case). Now we need to translate ONLY the lines in the "Value" column, which is highlighted in green in the screenshot, into German. 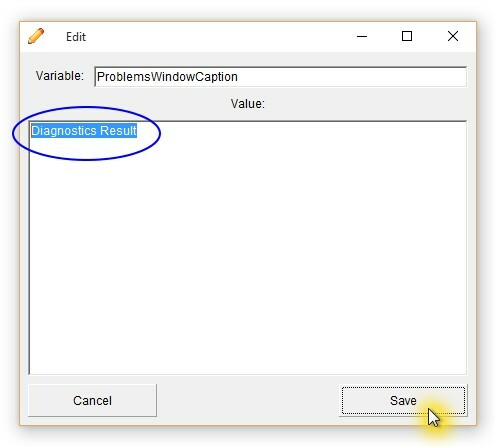 The text in the first column ("Variable") just presents the technical names of lines that are required in Kerish Doctor 2019 to facilitate searching for a particular interface phrase. They do not need to be translated. After you have finished translating all the lines in the "Value" column, click "Save" to save the new language file. Please note that the saved file name must match the original English name for the language into which you are translating. Do not change the file name. Keep the file name that the language file editor proposes (in this case, "German"). 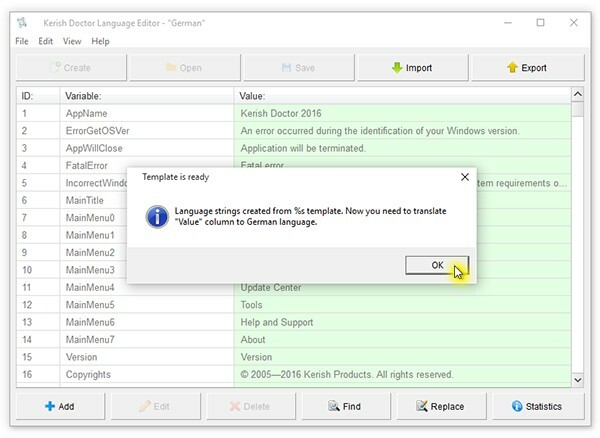 If you select a language that you are currently translating in Kerish Doctor 2019, then each time you save changes they will be immediately reflected in the application interface. 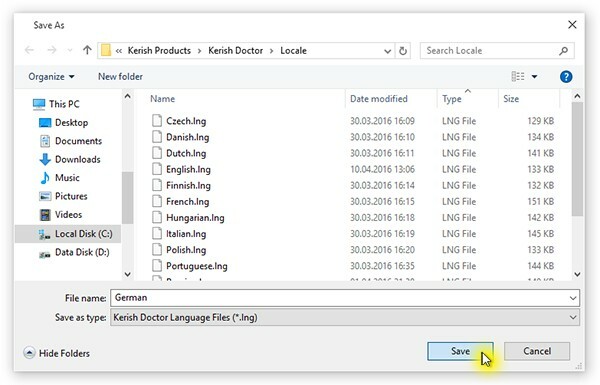 Please note that if you have enabled automatic updating of components in Kerish Doctor's program folder, this option will permit your edited language file to be automatically replaced with the official version from the Kerish Products server, leading to the loss of all of your changes. 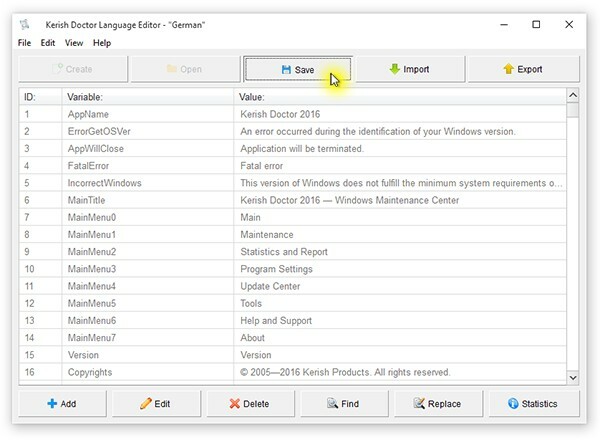 It is therefore recommended that you disable automatic updates in the Kerish Doctor 2019 settings before you finish working on a language file and send it to the developer at admin@kerish.org. You can also copy or save the edited file from the program folder to some other location on your computer. How can I make changes to an existing language? 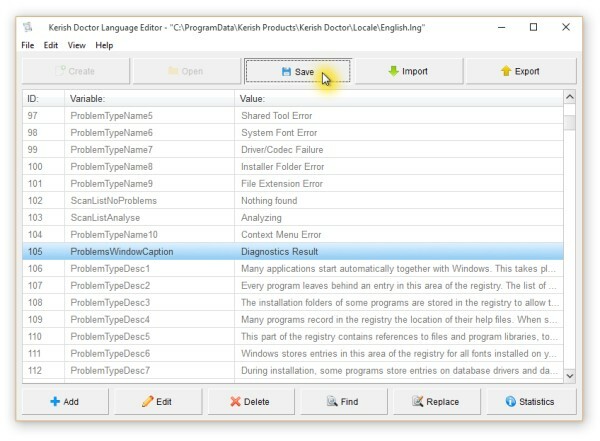 In order to make changes to a Kerish Doctor 2019 interface language, open the language editor. In this example we will explore the process of making changes to the application's English interface. Click "Open" to open an existing language file. An "open file" dialog box appears. In this case you should select the English file "English.lng" in order to edit it. After you open the language file, find the text in the "Value" column that you would like to edit. To find text strings more easily, use the "Find" button, which will help you find the necessary line. Just enter the desired part of the phrase in the search box to find the relevant line. When the search string is found, select it and click "Edit". Make the necessary changes to the second "Value" text field. DO NOT make any changes first to the first "Variable" text field. The text in the first text field just presents the technical names of lines that are required in Kerish Doctor 2019 to facilitate searching for a particular phrase in the interface. Do not change them! To apply the changes, click "Save". After you have finished making changes in the main editor window, a "Save" button will appear above it. Click it to save your changes. 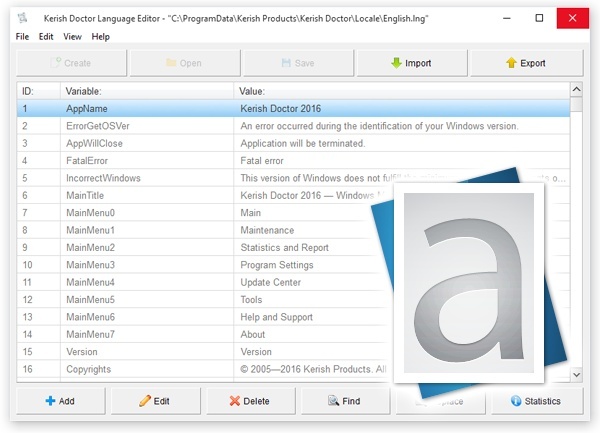 If the language that you edited is currently being used in Kerish Doctor 2019, then each time you save changes they will be immediately reflected in the application interface. What should I do with the finished translated file? You can send created and edited language files or links to them to Kerish Products technical support at admin@kerish.org. After a moderator checks the files that you sent we will update the official language components. As our way of saying thanks, we will be happy to provide you with a license key for the software, including free updates and technical support. If you have any questions, our technical support team would be happy to assist and answer them. Try to keep your translation as close to the approximate length of the sentences in the source text as possible. If your translated text is considerably longer than the original, this could lead to a situation where part of the text will not fit within the interface screen. If the text contains special tags (e.g., %n), then keep in mind that Kerish Doctor 2019 uses these tags to identify particular places where it should substitute a string of variable text. Do not remove any tags from the text. Try to keep the meaning of the translation as close to the original as possible. If you do not understand the context of specific phrases, please contact Kerish Products technical support at admin@kerish.org, and we will be happy to resolve any problem areas. 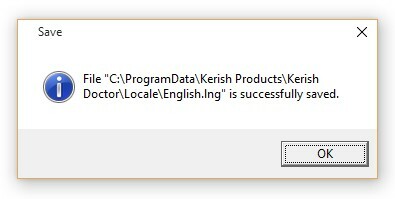 Please note that if you have enabled automatic updating of components in Kerish Doctor 2019's program folder, this option will permit your edited language file to be automatically replaced with the official version from the Kerish Products server, leading to the loss of all of your changes. © 2005–2019 Kerish Products. All rights reserved. If you find any typos or mistakes on the website, please report them to us.